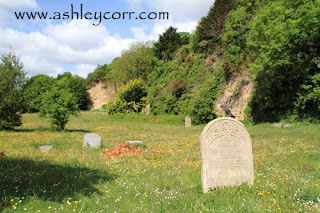 From the peaceful idyllic setting of the Northumberland Coast at Dunstanburgh to an eerie yet fascinating site in Houghton le Spring - Hillside Cemetery. I've lived in Houghton for twelve years now, yet it's only recently that this local site has come to my attention. I never knew of its existance until a few years ago when a story went to print in the Sunderland Echo regarding a gang of youths that had recently vandalised the graveyard, including the opening of a tomb. Many headstones were either felled or smashed during this rampage of sheer mindless vandalism, causing outrage in the local community. I don't know whether the culprits were ever brought to book, but the cemetery was later cleaned of all grafitti and some of the headstones were raised back into position to restore the site to a semblance of normality. 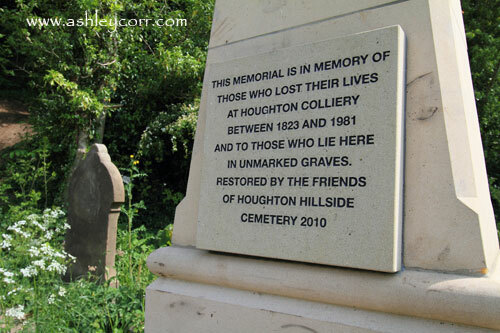 In December 2003 following a public meeting, the Friends of Houghton Hillside Cemetery were formed and since the formation of the group the site is slowly returning to its former glory. So far the group have carried out substantial conservation works within the site and also secured funds which saw the restoration of the Lych Gate and Railings at the entrance. They have also held their own fund raising events such as their annual open days, a sponsored graveyard gallop and more recently in 2008 a sponsored 10 mile walk. The walk was undertaken in atrocious weather conditions as it rained from beginning to end but this did not deter the Friends who took part. Tours of the site are undertaken several times each year and each time are attended by new visitors to the site together with many visitors who support the group year after year. Hillside is a cemetery located on the outskirts of Houghton Le Spring and the recently restored Lych Gate can be seen when driving along Houghton Cut on the A690 towards Sunderland. 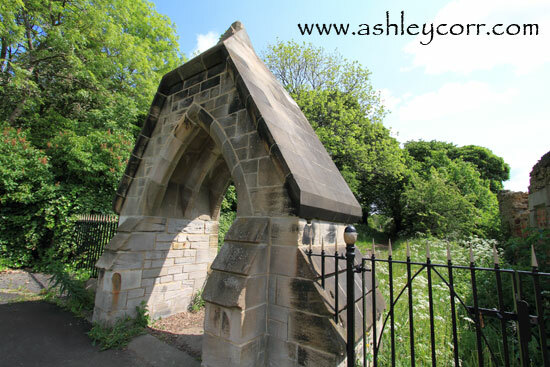 It is in actual fact not a cemetery but a detached burial ground for St Michaels and All Angels Church, however, it is more often than not referred to as 'the old cemetery'. It was consecrated in 1854 by Rector John Grey after a lot of controversy as the site was initially a quarry. There had been an outbreak of Cholera in Houghton Le Spring and as the churchyard surrounding St Michael & All Angels Church was full another site had to be found. Eventually after a lot of debating the Hillside site was consecrated. Initially the main entrance to the site was through Hillside Farm next door but in 1873 the Lych Gate was built and this became the entrance. The Lych Gate was damaged due to a road traffic accident in the 1960's. Due to the site being used less and less the Lych Gate soon became overgrown with ivy and other climbing plants. Although the site was a split level site, Hillside soon started to fill up and it was found necessary to have an extension which was opened in 1894. This also coincided with the opening of the Municipal Cemetery on Durham Road in Houghton Le Spring but as the municipal did not at the time have a consecrated area the authorities were forced to extend Hillside. There were about 7000 burials in total took place at Hillside. The last burial took place at Hillside in the 1970’s. Also, when the A690 was built through Houghton Cut in the 1960’s the cemetery was forgotten about. Sunderland Street, where the cemetery is located, became a dead end due to the recently built dual carriageway. Hillside quickly became overgrown and a haven for wildlife. During the building of the A690 the headstones on the plateau area of the site were bulldozed and plateau levelled. The stones are supposedly buried in the top left hand corner of the site. 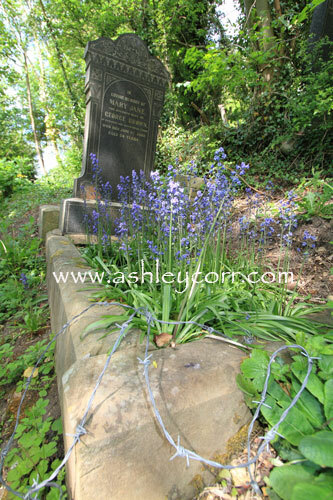 There are over 7000 people buried at Hillside including Rector Grey and Thomas Usherwood Robinson. Thomas Usherwood Robinson being the main objector in the controversy! Ironic to think that even though he was one of the main objectors he ended up at Hillside in the end. A conversation with a workmate who lives in the nearby village of Fence Houses turned to the subject of Hillside Cemetery. He encouraged me to make a visit with my camera as the cemetary was an interesting place to photograph. I said I would take his advice and get my arse up there, sooner rather than later. Since the conversation I often wondered what this place actually looked like, after hearing tales of this strange place that is situated on a hillside, just five minutes drive from my house. It was by chance that the following day I had my car booked in for its annual MOT test, at a garage just down the road from Hillside Cemetery. Instead of waiting in the garage while my car was being tested I decided to take a walk up to the cemetary and return to collect my car later. I had an hour to kill so off I trudged, up the bank to the main Lych Gate entrance (pictured here - photo one). Walking through the arch I headed along the path towards a plateau next to the cliff face. There were a dozen or so headstones scattered about and a recently erected memorial cross to honour the miners that had died at Houghton Colliery down the years, before its eventual closure in 1981. The place was desolate, just me and my camera phone, walking around this odd place that must have had many a story behind it, unknown to me. As I found myself at the far end of the plateau I stood next to the memorial cross and looked back across the plateau. It was at this point I thought to myself 'Is this all there is'. It certainly didn't live up to my expectations. I was told there were many gravestones standing up against the cliff face, but I didn't see any. I was about to head back to the entrance of the cemetary when I noticed a break in the trees behind the memorial stone. 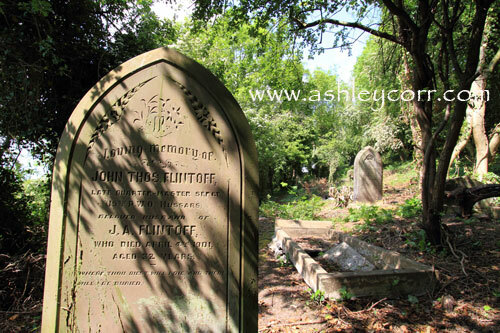 Intrigued, I walked into the wooded area on a well used path - obviously there was more to Hillside Cemetery than first meets the eye. 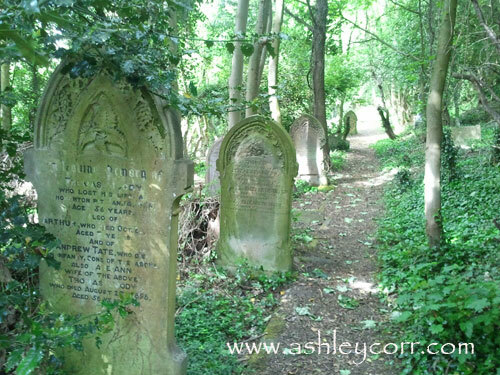 As I walked into the woods I noticed what looked like a gravestone, then another, and another. By now my mind was working overtime and it suddenly dawned on me that my visit to Hillside Cemetery was only just beginning. I hadn't seen anything yet! 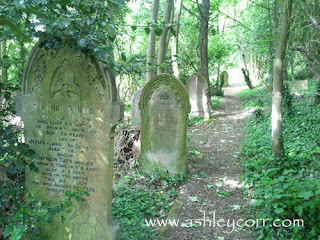 What lay ahead was something of completed astonishment - dozens of graves in a completely overgrown wooded area. It was definately a surreal moment, like a scene from the set of a horror movie. I was half expecting some zombie like figure to crawl out from the undergrowth and tell me to get back to the garage, as my car had failed its MOT with four broken coil springs, he he. I've visited some unusual places in my time but nothing like this. And to think, I'd been living on its doorstep for over a decade! The majority of the gravestones were vandalised. Many dated b ack to early nineteenth century - etchings on some were barely visible through erosion over the passage of time. As I walked further into the site I noticed a large black char mark on the ground, obviously the result of a fire by some locals - maybe even lit during a night time vigil whilst camping, who knows. Rather them than me. Nearby I noticed a blanket sticking out of the earth. I scraped at it with my foot, wondering what lay inside it. Maybe a pet had been buried at this spot. Just then my mobile phone rang loudly - I nearly shat myself!!! Places like this have a habit of hightening your senses and every little sound is heard, like a twig snapping nearby, or did it? Was my mind playing games with me, I wondered. It was broad daylight yet I wasn't having any of it. Call me a pussycat, but you had to be in the thick of this place to realise its ability to unnerve. 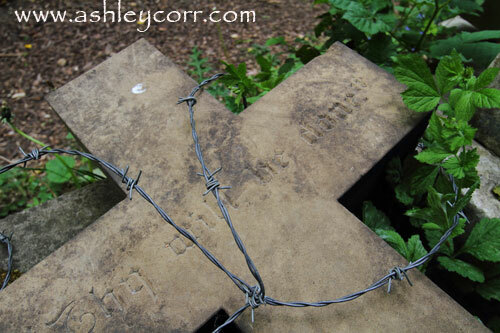 Another moment to forget was when I kneeled down to brush away leaves on a felled gravestone. I remember reading 'Aged 3 years' as a roosting pigeon in the tree above decided to fly off, making a racket in the process. Again, I missed a heart beat and feared a change of underwear was on the cards if I stayed here any longer. Time to go collect my car! Hillside Cemetery - a place I'll not forget in a hurry. A fascinating place. Hello again. It's been over a week since my last ramblings so I thought it best to show my face again. Not literally of course - wouldn't want to give you nightmares, he he. During May I visited the Northumberland Coast once again. My favourite stretch of coastline is Dunstanburgh to Holy Island, but my latest trip up north saw me dropping anchor at Dunstanburgh Steads. The approach road from the A1(M) reaches a cul-de-sac near the golf course which sits at the edge of the coastal walk between Embleton and Dunstanburgh Castle. After parking up I walked across the sand dunes towards Dunstanburgh Heughs, a place I've visited a few times during the last couple of years. There's a section of coastline that has a boulder field for a good half mile - thousands of almost sphere like black rocks that draw you in for a decent photograph. I timed my visit to coincide with the high tide in an attempt to try out my new set of ND filters. These filters are basically darkened glass, similar to polarizing filters, which reduce the amount of light that passes through the lens, which in turn allows very slow shutter speeds in very bright, sunny conditions. The slow shutter speed would enable me to blur the motion of the incoming tide, giving a kind of milky effect to the water. I like this kind of photography and I was hopeful of getting the shots I wanted. Of course, slippery rocks and incoming tide aren't ideal conditions - first and foremost there's the safety aspect, followed by the risk of water damage to your gear should the force of the tide turn nasty. A few photographers have become casualties of this well known stretch of coastline, including Terry Cavner, a local photographer who slipped and broke his leg before being airlifted to hospital. 'Tread carefully' I kept reminding myself. The weather was spot on. Warm, sunny, a slight breeze and barely a cloud in the sky. 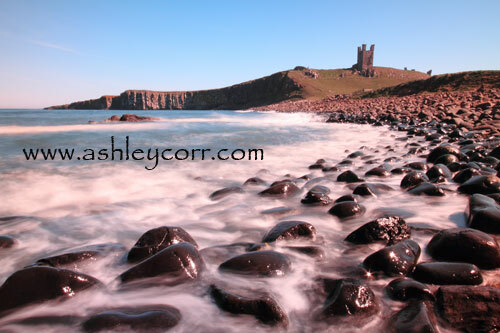 The tide was playing ball too - almost full tide when I arrived at Dunstanburgh Heughs. Time to play. After negotiating the boulder field with the aid of an extended tripod as a walking stick, I was in position and taking my first shots around mid-afternoon. There were a few walkers on the path to my right but no-one on the rocks in front of me, which was ideal - don't want any intruders spoiling my shots, eh. At one point I had three filters fitted to my wide angle lens - ended up with slight vignetting but eliminated it by increasing focal length of the lens, just slightly. After half an hour my legs were on the end of a good soaking from the incoming tide. I wasn't too bothered though as there's always a small price to pay when taking this type of photograph. Push your luck too much and the price could be higher! It's all about common sense really - not pushing the limits. Making pictures in dicey conditions is fine along as you know where to draw the line. I cut in a few times as the tide started to surround my feet - A simple case of staying one step ahead of the game. After 45 minutes or so I chucked the towel in. Well, not quite, but if I'd got my hands on a towel it would have been handy - I'd been well soaked by this time. I packed up my gear and headed off the boulder field to the safer, dry land. Eyed up a couple of new positions to photograph from, just below Lilburn Tower which sat on the crag above. A grazing field nearby had recently become a pond - something I'd never seen on my previous visits. Steam sat on the water, offering a nice photo into the bargain. 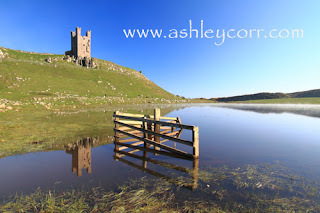 A lone fence drew me in as I looked for a reflection of Lilburn Tower in the still water. This is what I saw - shot 3. A nice little composition. A couple of people with camera's came over and nicked my position, not that I minded of course. It was probably the best viewpoint along this coastal stretch. Might as well capture it while you can. I returned home later that evening and watched a new drama series called Vera, about a Geordie investigator and the pilot episode was shot on the Dunstanburgh coastline where I'd been a few hours earlier. It was interesting stuff. I'd more or less traced their steps. And that's all for now. From the relaxed peaceful setting of Dunstanburgh to the eerie setting of Hillside Cemetary in Houghton le Spring. That's my next blog entry - coming soon. An interesting one to say the least!!! Durham City Centre offers countless photo opportunities. You notice something of interest at almost every turn and one area of interest that keeps drawing me in is the riverside walk from Milburngate to the Elvet Bridge. Between these two points on the route you pass probably the most iconic landmark in the whole of north-east England - Durham Cathedral. Some spectacular shots of the cathedral can be taken along the riverside, mainly from the south bank, during all four seasons, but especially in Autumn. After passing the cathedral the path takes a turn round the river bend towards Prebends Bridge. Again, there's photo opportunities here when rowing boats pass through its arches - mostly pleasure boats on hire from the guy next to Elvet Bridge. Elvet forms the subject of todays blog entry. It was an early Sunday morning when I took these shots and the weather was ideal - nice blue sky with some swirls of white to finish it off. Always nice for a landscape shot! Looking towards Elvet (first shot above) there was more than enough subject in the frame, making it quite a busy shot without too much clutter. Infact, from bottom to top of the frame there's enough to keep you interested, which I suppose was all I was trying to achieve. As I was in position early there were still plenty of boats tethered to the walls, giving a nice colourful and organised display at the edge of the shot. 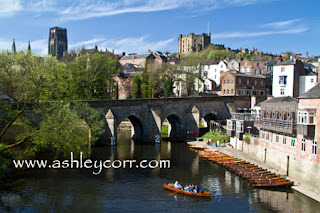 The Elvet Bridge, along with the houses behind it seem to give a nice balance in centre shot, with the ancient architecture of castle and cathedral sitting at the top. Incuded is a fair bit of green, giving a slight side step to the idea that this is a typical city centre shot, which it certainly isn't. The rowing boat on the water finishes the shot off quite nicely - mind you, I had to wait long enough for it to appear where I wanted it! My second shot was taken at ground level where the boat hirer was sat. It was here that I switched lenses, opting for a wide angle perspective instead of the bog standard. The scene in front of me was crying out 'Wide angle' especially as I was almost on top of the rowing boats. I knew this change of direction would give a nice angle and slight distortion of the boats, so I went from there. The 10-22mm wide is great to use and it never fails to surprise. I often wonder why it took me so long to get my hands on one. I wouldn't be without it now. The composition looked even better through the viewfinder after I'd fitted my 77mm polarizer and rotated it for best effect. Another piece of kit that travels in the kit bag at all times. Finally - shot 3. Taken next to Elvet Bridge. 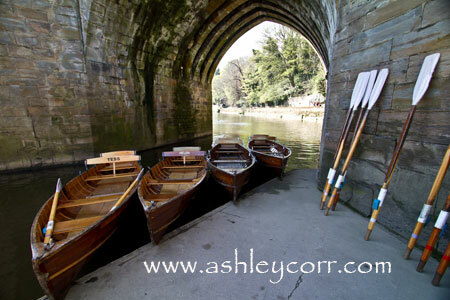 Something slightly different - boats under the arches with accompanying paddles, ideally placed against the wall. As soon as I saw the paddles I could see the picture in front of me immediately. It was simply a case of composing the shot as best as I could. I took three or four shots in both landscape and portrait format, metering off the stonework, which sort of burned out the sky in the background somewhat, but there ya go. 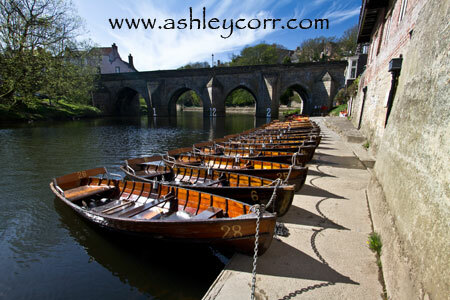 After taking my shots I wondered whether I should get my arse into one of these boats and head downstream. Then I remembered it had been years since I rowed a boat and this made me think on. I decided to give it a swerve - maybe it was too much on the owld fella's body, he he. I convinced myself I wouldn't have time to get down the River Wear and back in time for Sunday lunch at 12 prompt, so the decision was made for me - maybe next time (ahem!) Of course, next time never comes does it. Hello again, and welcome to another blog entry of mine. 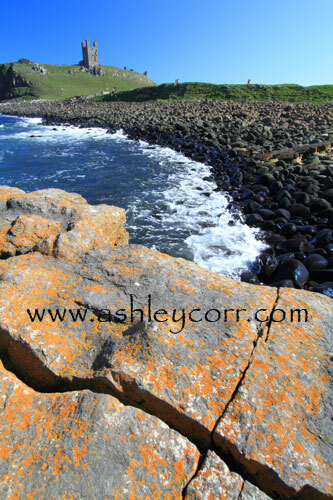 My site updates have been sparse lately due to other commitments - mainly printing, mounting and framing. I've taken time out tonight to give you an insight into our recent visit to Bedale in North Yorkshire. As part of a family day out we visited Ripon and Harrogate, before stopping off in Bedale. The weather was kind, infact very kind as the whole day was filled with bright sunshine and good temperature, making conditions ideal for getting off the beaten track and taking in some photography in the bargain. Bedale is a bustling market town which lies between the North Yorkshire Dales and the North Yorkshire Moors, in the district of Hambleton. The Riverside, although technically not a river, Bedale Beck makes a pleasant backdrop for walks and visiting points of interest along the way, including the Heritage Trail. Designed by the local Heritage Trust, the Heritage Trail provides an excellent insight into the extent of Bedale's colourful past. And it's colour all the way as you walk the many designated paths through the wooded areas and also the riverside route. We walked for miles, passing mant points of interest that I captured from behind the lens. A variation of colour awaits you at every turn, including daffs, cherry blossom and bluebells. 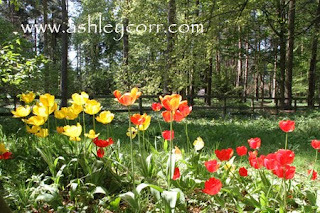 There was even a sudden burst of bright red in the form of some stray tulips - strategically planted just off the main path behind the fence. An example of it is shown here. Springtime is always full of activity and colour where plants and flowers are concerned. I'm not a big fan of this kind of photography to be honest, but sometimes seeing full bloom just isn't enough, so the camera records the moment for future reference. I like to think I've captured it quite well here. Today's photography was on the back of my recent visit to Mowbray Gardens in Sunderland, where once again I found myself capturing a burst of colour amongst the flowerbeds. At the turn of the year (2011) I made the decision to capture as many colourful flower shots as possible, mainly due to the fact that I had virtually no stock library and also my plans to include them on calendars and postcard designs. I'm not finished yet - I've earmarked more places of interest where I'm guaranteed some decent shots - just waiting the right weather and I'm off! Bedale was an ideal stop off and another place I shall revisit, maybe in Autumn when the place will be bathed in more colour. We had a nice bar meal in the Three Coopers Inn before heading home. Proper real ale too, although I gave it a miss as I was soon behind the wheel and northbound on the A1(M). A nice day all round - weather, scenery, pub grub and photography - why man, ya cannit get vexed! Thanks for stopping by. I'll be back soon. 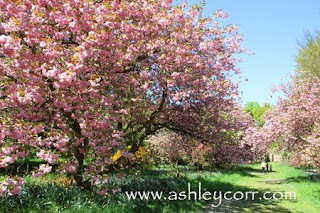 We've had some great weather recently, especially over the Easter period. During this time I made a visit to the North Yorkshire town of Ripon, which is approximately 56 miles from my base in Houghton le Spring. Ripon is the home of Fountains Abbey, the largest abbey ruins in the UK, which is situated in the Skell Valley and has 800 years of history behind it. 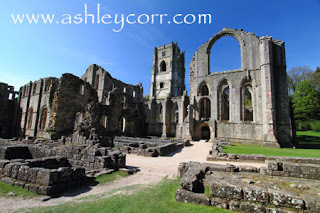 The abbey was founded in 1132 by 13 Benedictine monks seeking a simpler life. They later became Cistercian monks. The River Skell runs through the valley and under The Abbey - which in itself is a masterpiece of twelfth century building ingenuity. It's quite easy to soak up the spiritual atmosphere, almost losing yourself in the passages, staircases and towers that display ancient architectural craftsmanship at its very best. I've visited a few ancient sites during the past few months and I'd safely say that I probably won't see another of this size for some time to come, unless it's somewhere overseas. 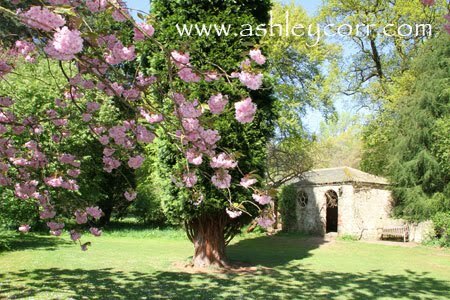 My first shot (shown here) was taken as I arrived in the abbey grounds from the footpath which began at the site entrance which was only a few minutes walk. It shows Fountains Abbey, straddled bya huge lawn - one of two that flank the east and west sides of the abbey. From here I made my way inside the abbey to an area known as the cellarium, which is shown in my second shot. Amazingly the cellarium roof has remained intact and the lay brothers ate, slept and socialised here, beneath the incredible vaulted ceiling which escaped Henry VIII’s brutal sixteenth century dissolution of the abbeys. Today the inhabitants are protected species of bat who live in the ceiling nooks and only come out after dusk. It is estimated there are over eight species of bats living in the cellarium. During the Autumn the cellarium is lit by coloured bulbs as part of the illumination tours that the National Trust runs at the site at dusk. Someone climbed down an embankment and into the far window of the cellarium as I took the shot, which you can see here. From the cellarium I walked through to the cloister area which was surprisingly quiet, but ideal for photography, despite the high volume of visitors to the site while I was there. Once used for meditation and exercise by the monks the cloisters formed the centre of the abbey and many rooms lead off from this area, including the warming room where you can still see the huge fireplace where a fire was always kept roaring. Above the warming room up the external staircase to the left, is the muniments room where the monks kept all their important documents, it made sense to keep them above the warming room so the documents stayed dry in all seasons. The floor tiles in this room have just been refurbished and the room has recently been opened to visitors. Today I was photographing solely with m y 10-22mm wide angle lens. This glass is tailor-made for tight architectural passages and alleyways, plus the low level shots of overhead stonwork such as archways and high windows - perfect examples of which were found in the church area of the abbey. The dominating tower also got the wide angle treatment as I stood very close to its base. 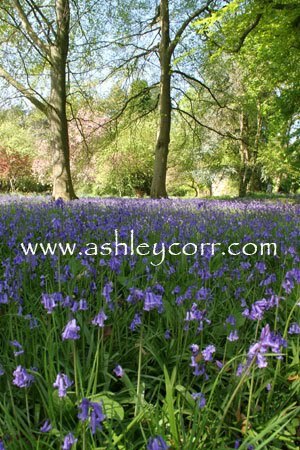 I have a selection of images, approximately 25, that I will be uploading to my web site ashleycorr.com in the next couple of days. 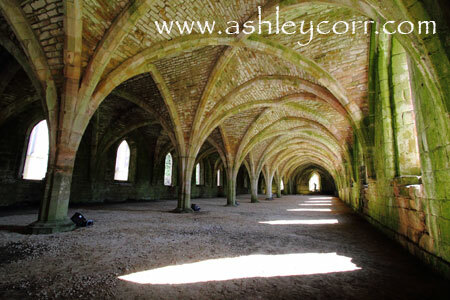 They will form a new gallery page that is dedicated to Fountains Abbey and it will get the usual slideshow treatment with accompanying music. 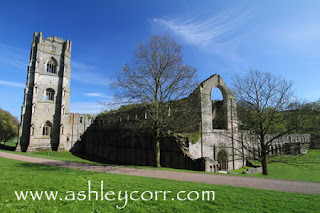 The surprising thing about this National Trust site is that Fountains Abbey only forms a small part of what is actually on offer to the visitor. The grounds also extend to Studley Royal, a huge estate of beauty including the Georgian Water Gardens, a deer park, Anne Boleyn's Seat, Studley Lake and the Serpentine Tunnel, to name just a few. I'll have to cover that lot another day, as my three hour visit was over in no time and I only visited the abbey! Anyway, that's about it for now. Keep an eye out for the new Fountains Abbey gallery which is due to go live shortly. You'll get an insight into the ancient ruins through my camera lens. I hope I done it justice. Until then, see ya next time. Stacks of new photo's to get through!